Turns out they were moving out of my house. The ones heading toward the yard were carrying eggs, larvae, and pupae. As I watched them though, I noticed something else leaving with them that didn’t look quite right. When I first saw one of the critters above, I knew it wasn’t an ant. My initial thought was it must have been a tiny roach. That first one was gone before I could react, but I headed inside to grab some containers in hopes of seeing more. Over the course of an hour and a half, I spotted three more and managed to grab a couple of them. Watching one, it seemed unsure of its course. At times it would bump against some incoming ants and dart away. It would always rejoin the column, but sometimes moving in the wrong direction. Eventually it would right itself, almost always after encountering an ant carrying a larva or pupa. I’d guess it can’t follow whatever chemical signals the ants are tracking and instead relies on following the cargo. It got me wondering how the ants know which direction to go in. I know they follow a chemical trail, but what tells them which direction they should go? Actually, lots of questions came to mind as I watched them. How do they know it’s time to move? How do they decide on a new nest location? Later, I gave the freeloaders the white paper treatment. I began to wonder if these weren’t crickets. I grabbed Arnett’s American Insects and started skimming the cricket families listed there. 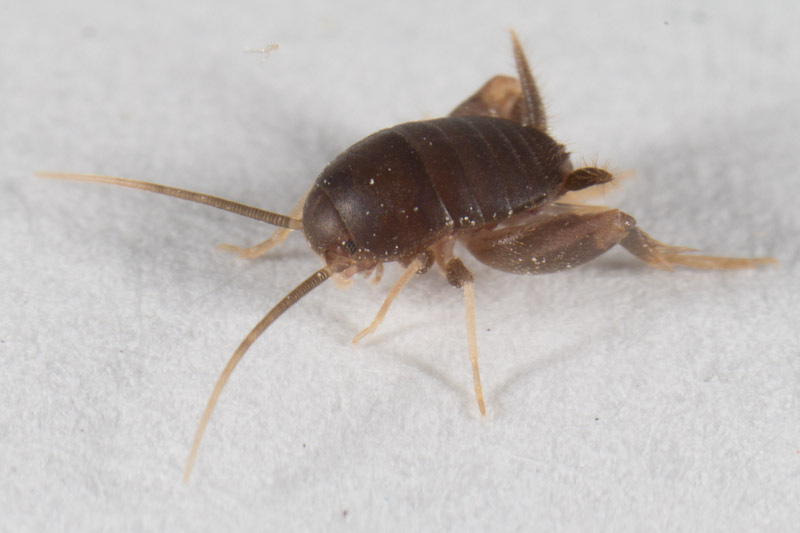 When I came to Myrmecophilidae (Ant-loving crickets), I figured that must be it. I briefly thought I might even be able to contribute something to BugGuide, but it turns out there were plenty of photos there already, confirming the identification. Both the specimens I captured have ovipositors and so must be female. I found some good info on these in my Field Guide to Grasshoppers, Katydids, and Crickets of the United States. 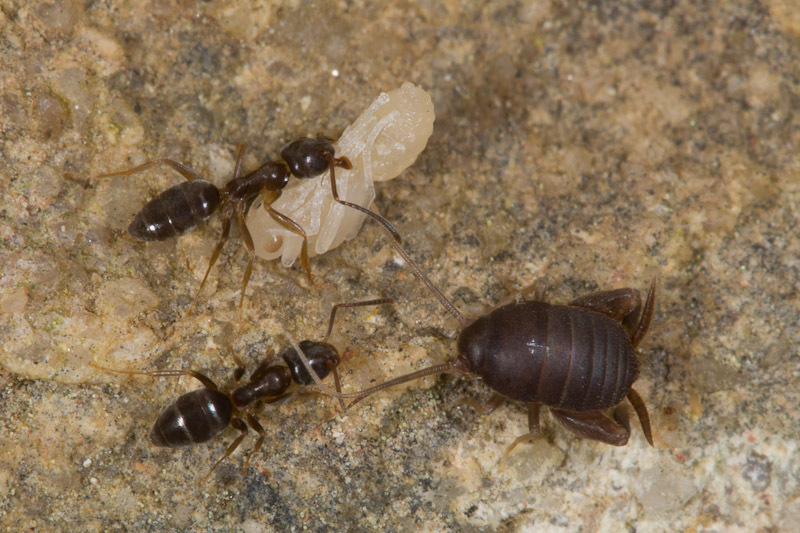 These crickets only live in ants nests. 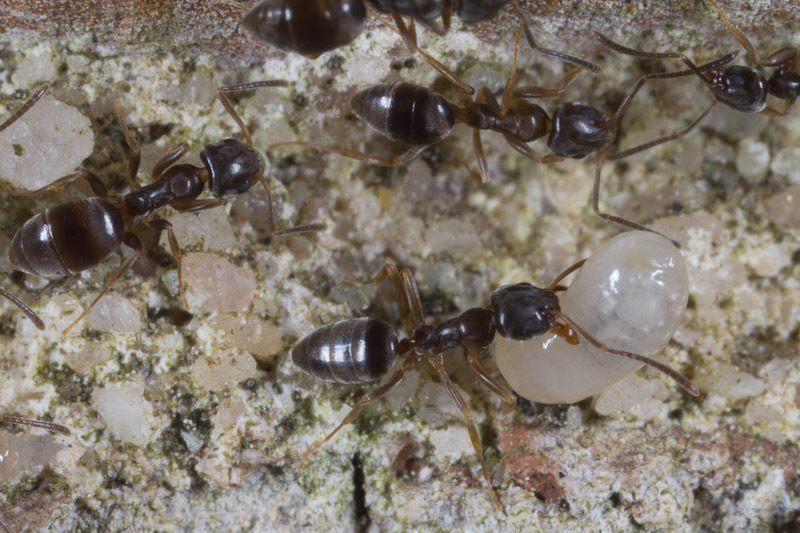 They apparently feed on oily secretions from the ants bodies, causing no ill effects. 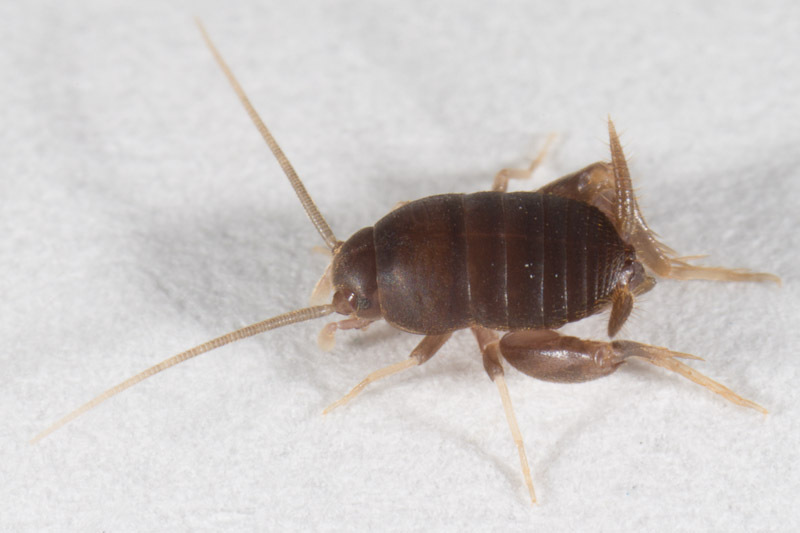 Only one species occurs in my area, the Eastern Ant Cricket, Myrmecophilus pergandei. 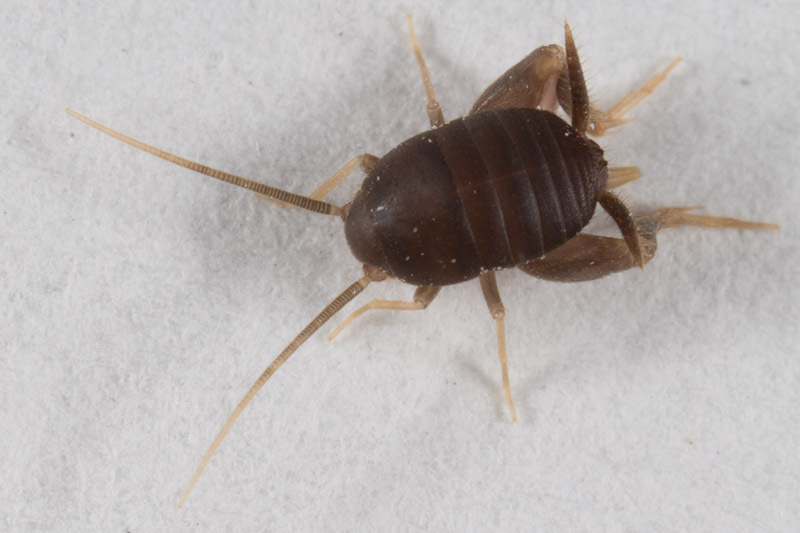 This particular cricket species has been found living with eleven different species of ants. 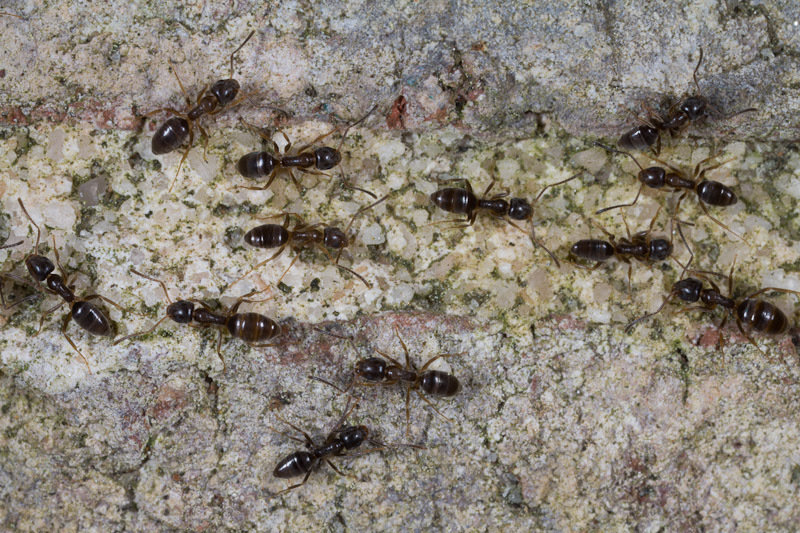 Speaking of ant species, I decided to try and identify the host ants. Using the key in Ants of North America: A Guide to the Genera, I arrived at Tapinoma. 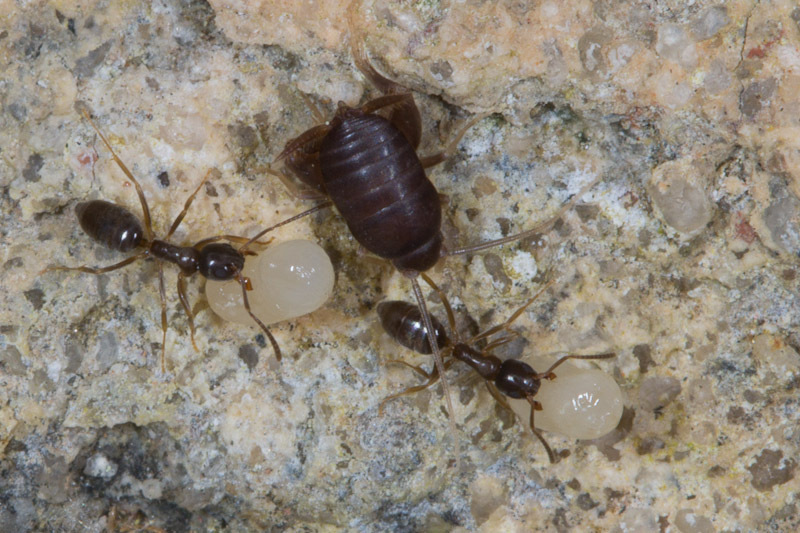 Based on the remarks there, I believe these ants must be Tapinoma sessile. 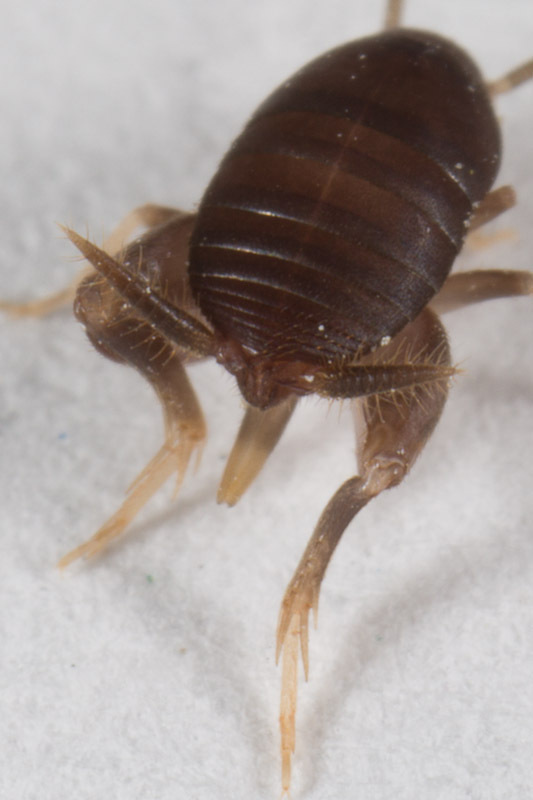 I sacrificed one to see how well the common name of Odorous House Ant applies. It was indeed odorous, and as I mentioned, they were leaving my house. As I watched the ant column, one other thing caught my attention. Fairly often, I’d notice a much larger ant passing by, about twice as big as the others. I snatched one of those as well. 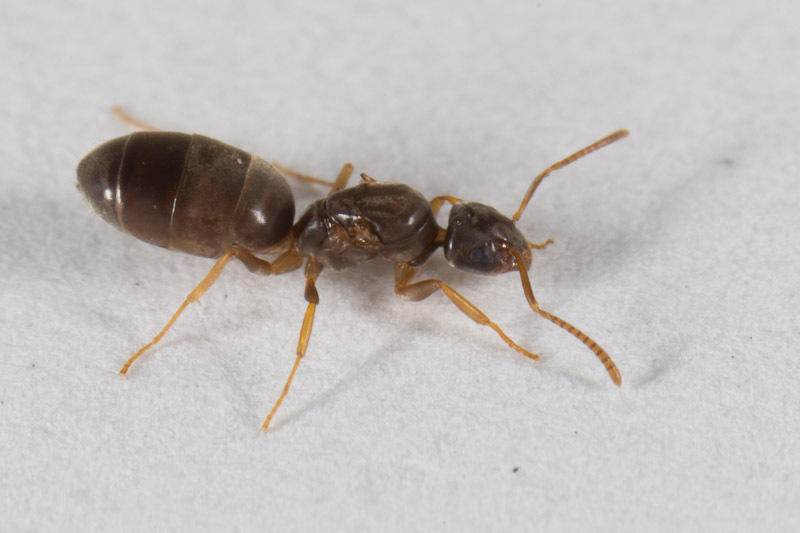 Remembering some of Alex Wild’s comments from his blog entry on how to identify queen ants, I recognized this as a queen. That only confused me though, since I had seen perhaps half of dozen of these in the brief time I observed the column. 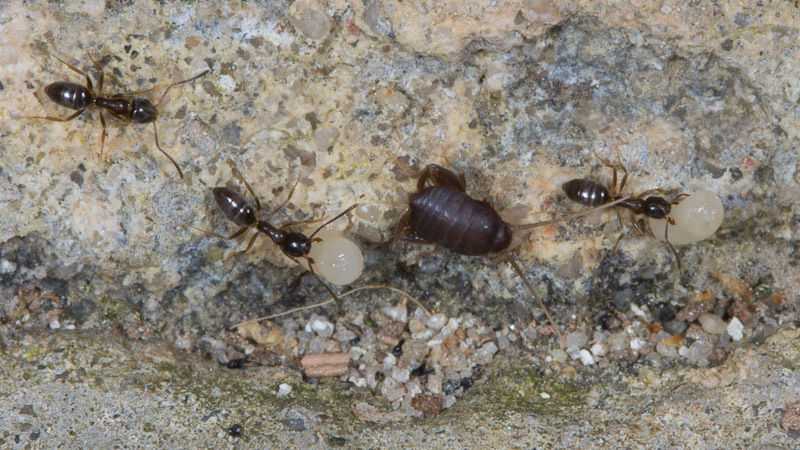 I naively thought that ant nests generally had a single queen. 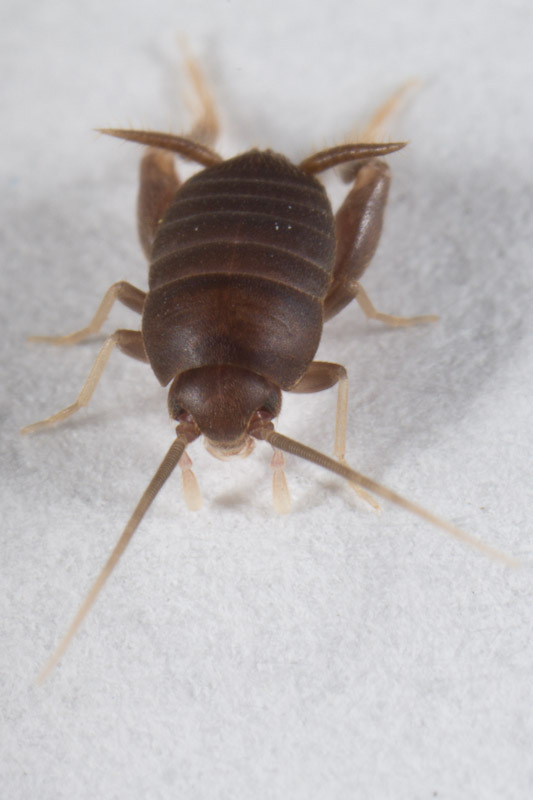 The wikipedia entry for this species says that its nests can actually have hundreds of queens! I wasn’t familiar with either of these interesting insects when I started watching them. Had I encountered them a week later though, I’d probably have recognized them from a recent post from Alex Wild. He scooped me, but I couldn’t let the opportunity to blog about them pass. What happened to the ants you might be wondering? Well, they can’t seem to make up their mind. As I write this there is still a column going strong, weeks later. They were steadily moving out for almost a week, but then at some point I noticed they had reversed course and were moving back in. I don’t want to imagine just how many thousands of ants there are somewhere in the walls of my home. Fascinating! I still haven’t found any myrmecophilids, although I’ve been looking – I guess you only got the chance because your tribe was on the move.